Which Greek Island should I visit and when? I receive constantly this question as Greek traveller from people all over the world who are overwhelmed by the plethora of choices… or the lack of them! Why? When you Google for greek itineraries thousands of travel websites/blogs inform you about Santorini and Mykonos, hundreds about Crete, Corfu, Zakyntos (Zante), Rhodes and Kos and… that’s it! So it is not surprising that people who are looking for the first time to visit Greece they usually do the route Athens (for 1-2 days if any!) – Santorini – Mykonos and… they believe that they have visited Greece! Don’t get me wrong, it is a decent (but expensive!) start and I am happy that the last years some bloggers write about Naxos, Paros and the islands around Athens (Hydra, Poros, Aegina) too, but as a country with over 6000 islands (of which over 220 are inhabited) I think it is time for the travellers to go a bit deeper regarding which Greek island to visit and why. In this post I will talk about the islands and not the (equally amazing) mainland so if you want to read about our mainland please be patient! 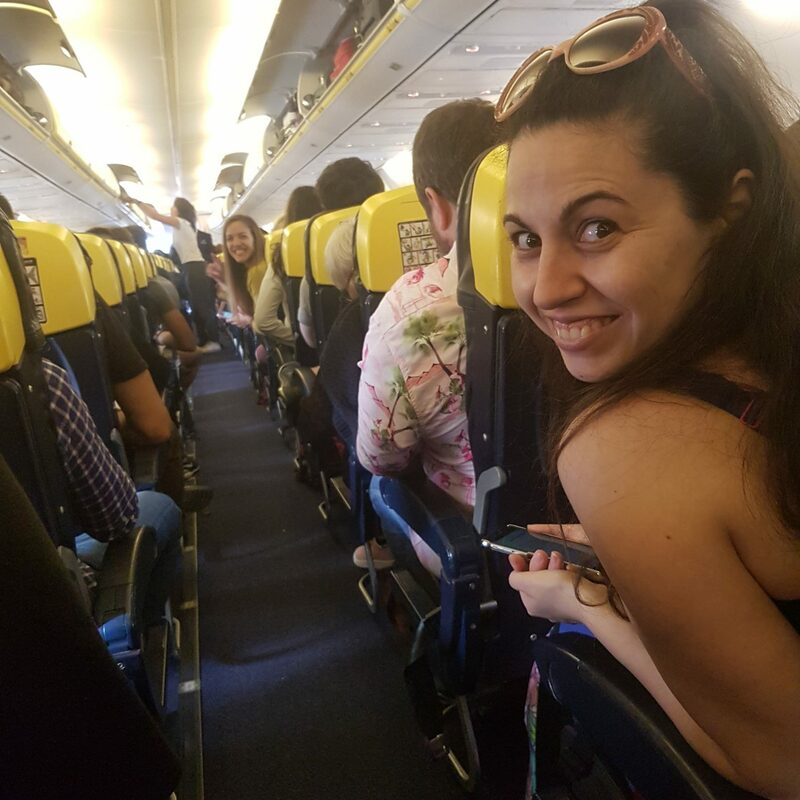 Deciding which island(s) to visit is an uneasy decision as you have to take into consideration a lot of things because, as in any island-country, the transport can be such a pain! Also, most of the islands have a completely different feeling in wintertime, others have differences even from one month to the next one etc. You don’t want to do such a long journey just to find out only one bakery open…or do you? Conclusively, let’s see individually the main factors that may affect your decision! The peak months in Greece are July – August. The super peak (and the most expensive) period is 1-20 August as most of the companies are closed for holidays, Greeks run away from the cities to reach the sea (hence it is the month with the least traffic in Athens- I love it! ), the entire country chases the summer in every coastline plus the million of tourists arriving at the same time! As a result, should you wish to visit Greece this time of the year please avoid the popular islands and visit the least famous ones (which, by the way, have the best connectivity with the mainland/ bigger islands this time of the year!). Book in advance (especially for August) ferries / tickets / rooms etc as especially the small islands have limited accommodation choices and be prepared for the heat; the temperature can reach 42C! the only way to escape the heat is jumping here! You would be surprised of how many islands have airports, even some tiny ones as Kasos! Air- connection is vital for the people there especially in wintertime as the rough sea can sometimes cause ferries delays or even cancellations for weeks! Most of the airports connect directly the islands with Athens (some exceptions here for example for Kastelorizo you have to fly through Rhodes) so if you want to avoid the ferries just check for airports too. Moreover, you can use these islands airports as a base for island hopping but double check the ferries routes first, not every single route operates every day! no, this is not a ferry! Swimming, sailing, hiking, climbing or sea sports? Well, you can do most of these in pretty much any island but some are better than others for a specific activity. For example Ikaria is famous for surfing (and the longest living population amongst Greeks! ), Milos for the amazing (and diverse!) beaches, Kalymnos for rock-climbing, Ionian islands for sailing, Leros, Donousa, Gavdos and Irakleia for free camping (it is illegal though!) etc. Almost every island has dramatic cliffs, amazing views overlooking the sea, snorkelling spots (everywhere! ), semi-abandoned chapels, many stairs and wild routes for hiking. Forests can be found mostly in Sporades Region (Allonisos, Skopelos, Skiathos), Northern and NE Aegean islands (Thassos, Samothrace, Mytilene etc) and Ionian (Corfu, Kefallonia, Ithaca, Paxoi, Leukada, Zakynthos), while the picturesque white houses with blue windows/ doors can be found in the entire Cyclades Region (oh yes, you don’t have to go to Santorini to see them!) but in some cases you wont even find a single tree to rest under the hot sun! Argosaronikos Region (the closest to Athens islands) and Dodecanese have different architecture and nature too. What about commuting inside the islands? Some islands are so small and quite flat for the… greek standards so you do not need anything other than your feet (such as Koufonisia that you can also rent a bike without…dying under the hot sun). Many islands offer some public buses or boats to reach other parts of the island/beaches (Symi for example has a very good water taxi system). The bigger islands have the same coach company as the rest of Greece, named KTEL, which provides many routes inside (and outside!) of the islands. This is a cheap way to get around but it is far from perfect. The best is to rent your own motorbike/ car/ ATV (depending on the size of the island, for example a car in Chios or Crete is amazing choice but not in Kimolos!) but you have to be very careful due to the poor infrastructure, the endless loops and the lack of traffic lights. Despite the horrible stories you may have heard of driving in our islands, your personal vehicle can be your best bet in here! However, there are islands that no private vehicles are allowed such as Hydra and Trizonia- this may be considerable too! This is a tricky one! Some people when they refer to “local vibes” they mean they just want to have every comfort/ nightlife they are used to back home plus some local restaurants to try the food, a bit of sea and better weather! If this is the case then head to Malia in Crete, Cavos in Corfu, Laganas in Zante, Faliraki in Rhodes, all inclusive hotels, resorts etc. Personally, I avoid these places at all costs! I lived in Crete for over a year and I visited Malia once just to form my own opinion (which didn’t change as I had already visited the other places). There is nothing bad of drinking alcohol, partying/ finding pubs (which, by the way, do not exist as concept in Greece at all, when you see a pub you can assure you are in the most touristic area you can be!) etc but this is not Greece, as Pattong in Phukhet is not the entire Thailand. Regarding the local feeling there is a simple rule, the less known an island the most chances of being “authentic”. Of course, there are plenty of local places/ experiences in popular islands as well but you have to do your own research beforehand- in the future I hope to help with more posts about this struggle. Enjoying the view with some local…goats! Greek food is famous and tasty and you cant go wrong in any island! However, some islands are more famous for their food/ recipes than others. For example, Crete is one of the best islands to gain some weight! Santorini has amazing sweet wine (Vinsanto , please do a wine tour if you have the chance!) and great fava (a type of lentils we eat as Arabs eat hummus). Chios has an amazing type of cheese, Mastello, that is similar to halloumi (but much better in my opinion! ), Syros a dessert-pie called halvadopita and Naxos the best potatoes variety. Traditional pastas can be found in many islands along with great seafood and vegetarian dishes! You get the point! The downside of the very small islands is the lack of choices when it comes to food (and coffee/ nightlife) so if you are a foodie and want to have heaps of choices head to a medium/ big size island. If you have 3 days don’t go to Crete, Kefallonia, Corfu or any other medium or big sized island. On the other hand if you have 20 days to spend you may be bored in a tiny one! Please PLEASE do not try to squeeze 4 islands in 1 week, I know it is difficult to realise how much time the ferries actually waste, how dissimilar each island is (one can have the main “town” next to the port and the next one half an hour away, not even mentioning the beaches and other attractions!). As a general rule I would say 3 full days in the smallest islands are decent (unless you really want to relax, get to know the locals etc) 5 days for bigger islands, 1 week for islands in the size of Chios, Kefallonia (including day trips to surrounding islets) , and for Crete or Evoia anything less than 7 days is just a rush – unless you opt for one region only let’s say Chania or Aghios Nikolas province. You are tempted to see everything, I feel you (been there done that!) but trust me and do yourself a favour and do not spend all of your time in commuting/island hopping. As abovementioned, the hottest months are July and August so if you cant stand the heat avoid these months. Alternatively, travel to the Northern islands (Samothrace even has waterfalls to cool you down!) that the temperature difference can be around 5C less. September is a good month to visit but the daylight is shorter than in May; on the other hand the sea is warmer, with this information you can consider what is more important for you. However, in my last paragraph I am bringing into consideration a usually overlooked factor that even bloggers who have dedicated blogs for Greece (or write for the country consistently) do not understand/ realise unless they have lived in Greece for years. I am even more confused! Could you make it a bit easier? Sure thing! 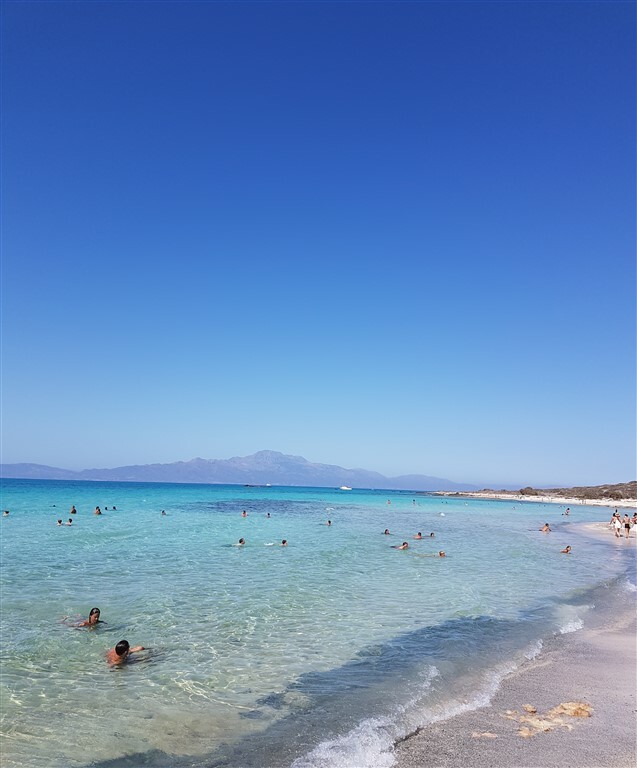 I have combined a small guide separating the islands in months; of course, the term “best islands for this/that month” is subjective but I have taken into account the accessibility (it s easier to visit Kimolos in August than in May for example! ), how busy or not the island will be (Pserimos has 80 citizens so again August will be a bit busier!) and how many things-to-do you can find in each one. I hope you will find it useful but once more, this is my personal opinion as Greek, after being in over 50 Greek islands and living in Crete too. Best islands for August if you want to avoid crowds as much as possible: Kithira, Astypalaia, Nisyros (has a volcano too not as magnificent as Santorini’s one though), Irakleia, Kasos, Halki, Anafi, Psara, Oinousses, Trizonia, Sikinos, Mytilene, Aghios Eustratios, Kimolos, Pserimos, Leipsoi, Arkioi, Lemnos etc. August in Halki, few beaches only but such crystal clear water! Psara in August , peaceful and great swimming, camping and hiking spots! 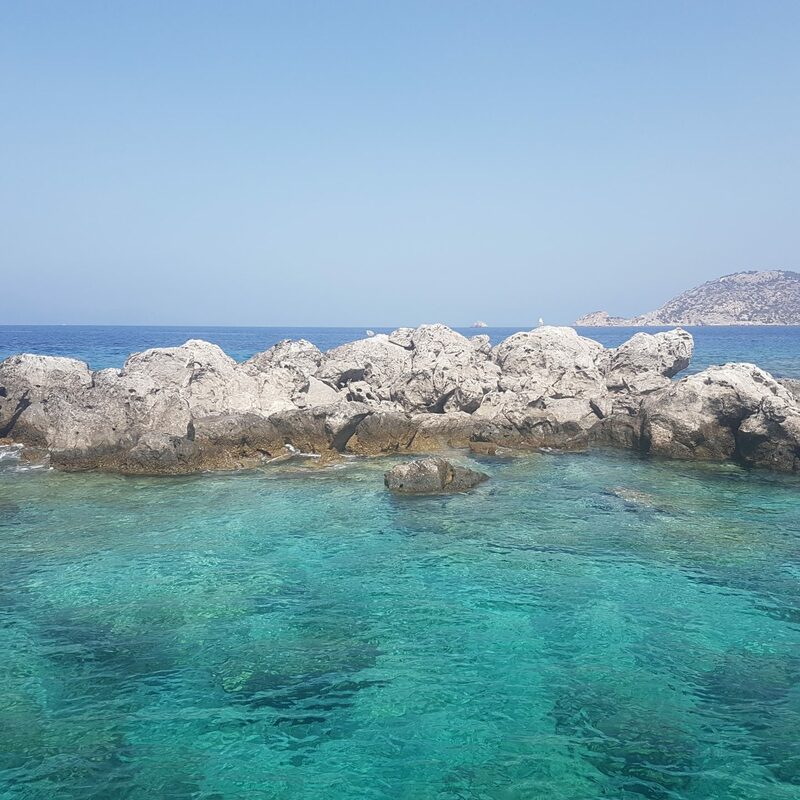 Best islands for July : Amorgos, Ikaria, Fournoi, Samos, Syros, Kefallonia, Ithaca, Samothrace, Thasos, Kalymnos, Karpathos, Patmos, Leros, Euvoia (the perfect road-trip from Athens) , Chios, Skyros, Elafonisos, Spetses, Serifos, Sifnos etc. Best islands for shoulder season or out-of-season : Crete (warm even in winter but not above 20C), Evia (easily accessible from Athens- no need for a ferry, nice nature and historical places), generally speaking any big island that can accommodate you because the small ones have most of their businesses shut around beginning of October. If you are a winter swimmer this is perfect timing for the Ionian sea too (Aegean and Cretan sea is usually more windy) . Don’t forget that hundreds of people live here in winter too and all of the (inhabitant) islands have people all year round! When to visit Santorini then? You may have noticed that I skipped Santorini! I think it deserves a paragraph itself but I will be a bit sarcastic here : If you want to be packed with thousands of people, pay double the prices, receive mediocre services and then complain about “How overrated and expensive Santorini is” go June-August! My favourite visit in Santorini was end of April/beginning of May (even if it was a bit cold for swimming) but end of September/ October is also a good choice if you are prepared for chilly nights. Around the Easter time (Orthodox- usually April/May) the prices go up a bit so keep this in mind but the Easter season is special in Greece (for good and bad reasons to be fair) so you may want to experience this too. On the other hand, if you do not like summer/ swimming/ heat at all I would say end of March is ideal as the daylight starts peaking again and there are sunny/rainy but not hot days- check the cloudy days though as you may end up missing the sunset from Oia and the volcano view due to that! Santorini has veryyy basic beaches (in comparison with the rest of Greece) so this is one more reason you do not have to worry about missing out them should you decide to visit it autumn/spring/winter. The second famous island! Mykonos is a bit different as it has some great beaches and seawater but most of them are occupied by resorts / beach bars that will charge you an arm and a leg for a sunbed and an orange juice (this does not happen in less popular islands!) ! Mid of May is a good season to visit, the prices are a bit lower and the sea starts to warm up! If you are a party animal, of course there are parties all year round but the summer ones really stand out so it is up to you what you would rather to sacrifice. There are camping and hostels and Mykonos is famous for the LGBTQI+ community vibe that is very alive and special. Once more, please bear in mind that these 2 islands are the most expensive in Greece and they do not represent the country’s prices/ lifestyle! Reaching the end I have to clarify this as I find the…warning “Avoid the high season!!! !” in every Greek topic and even if I respect this opinion I feel it comes from less experienced travellers inside the country. So far we have talked mostly about the cons of the peak season trips. However, there are some valid reasons to visit Greek islands in high season (beyond the ferries that operate more often!). let me explain myself (free camping in Ikaria gorge) ! We, Greeks, live for the summer, even the people who do not like the hot weather; we count our lives in summers where we do not care much about the important things (unfortunately) but we are more optimistic than usual (and more than we should be!). A famous Greek politician in the past said that “whatever you do, do not cut down the people’s swimming days!”. The worst agreements / law changes have taken place during the summers, the worst forest fires occur the hottest months and for people who work seasonally this is the toughest period (6-7 days per week, 12 hours per day). But everything is possible in the summer too! The biggest islands fiestas (panigiria) are in their peak now! People dance, sing, celebrate the local Saints, paint their houses and the pedestrian cobbled streets, organize theatre plays and gigs, book fairs (even in the tiniest islands! ), traditional food/drinks festivals and art exhibitions. The islands are more alive than ever and there is a celebration atmosphere all around – especially in between 8th and 16th of August. The 15th of August is one of the most important religious celebrations in Greece and you can find fiestas to participate in every island- some of them have very unique traditions such as in Koufonisia where in the morning people (locals and tourists alike!) hop on the local boats and go to the neighbooring unhabited islet (Kato Koufonisi) to celebrate at the one and only old church. Even taking the ferry for 20+ hours can be a…local adventure as you will not only experience this first hand but additionally you will watch people and how they behave (not always politely) ! All of these are part of who we are and, let’s put it that way, you can’t experience the real Greek lifestyle if you always avoid the summer months. Just follow the previous advices on which island to choose and when and keep in mind that some celebrations take place even the first 10 days of September! You are welcome to join the party! So, which Greek island will you pick now? I love a local’s guide to anything! So reading this local’s guide about GREECE made me feel like I had found the jackpot! Thanks for all of the amazing tips :). What a great post to find! My friend is getting married and his bride to be really wants to go to Greece for honeymoon. He has put me to ask to make the itinerary and I have been sort of lost and overwhelmed with all the options. This so helpful, I can’t even begin to explain. Thank you! This is a very interesting post and I can relate to you when you say that you receive a lot of questions on which island visitors should pick. I will share it on my boards. Keep up gathering “travel moments”!! This will be life journey to remember!! Hi Valentini, this is such a helpful and detailedpost. I’m going to be living in Stoupa for 5 months over the summer and was thinking of taking one or two trips to an island or two. I have now got a whole load of things to think about. I love Greece! Wow Peloponnese is an amazing region (technically a huge island!) and I am pretty sure you will have fun living there! Beaches, history, mountains, rivers, hiking, food, culture (you need to go for a play at Epidaurus Ancient Theatre). Must islands around: Kithira/ Antikithira, Elafonissos, Spetses etc and if you are up for something s bit further up and really unique and tiny… Troizonia! Happy that my post will help you and that you love Greece! Have a blast <3 ! Thank you for all the info. I’ve been staying on Lesvos Island for the past two months. Braving the winter there! We’ve enjoyed a local experience without any tourists! So pleased to see the beautiful Almond blossoms come out now. This was really informative!! Thanks so much! So many things I had never considered before – I’m going to keep this for when we travel to Greece! What a great post! When I first went to Greece I hate to admit that I also did Athens, Mykonos and Santorini…I feel that it was a good introduction to what the islands had to offer. However, now having been to a few different islands, there is so much more than the common ones. I hope that people who travel there now are more aware of all the other amazing islands when planning their trips! I love Greek food and have always wanted to visit. I’d definitely go for a longer stay and see more of the larger islands such as Crete, Chios, Kefallonia etc. Thank you so much! This was so helpful! My sister and I are going in August, which I realize is the peak season but we couldn’t get it to work out any other way. We have ALWAYS wanted to visit Santorini and since we are going to have to go during that time, do you have any tips for us to make it more bearable? What a comprehensive guide to when, where, how to visit the Greek islands. This is all one needs to plan. Personally I would avoid the postulate beaches in summer and like you said… head to to lesser known. Thanks for compiling all the information. Error: Error validating access token: Session has expired on Tuesday, 02-Apr-19 16:48:27 PDT. The current time is Thursday, 25-Apr-19 11:49:00 PDT.